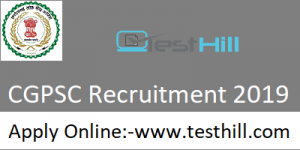 This article is for the candidates who were waiting for for the CGPSC Recruitment for a long time. Here is good news for all of them. The department, Chattisgarh Public Service Commission has released the official notification regarding the CGPSC Sports Officer, Librarian Recruitment 2019. The process to apply for the same will be online. The online applications have started from 5 April 2019. All candidates can apply for CGPSC Recruitment till the 4 May 2019. The declared recruitment consists of a total of 117 posts. Scrolling down to know all the details about the same. The department, Chattisgarh Public Service Commission has released the official notification regarding the CGPSC Sports Officer, Librarian Recruitment 2019. The notification is to fill up the Librarian & Sports Officer profiles. The recruitment is available on the official website i.e. www.psc.cg.gov.in. The department, Chattisgarh Public Service Commission has released the CGPSC Sports Officer, Librarian Recruitment 2019. The admit card will also launch a few days before the examination. The syllabus for the CGPSC Recruitment 2019 is differed according to the post. To know about the syllabus and other information you have to visit the official website, where you can find your syllabus according to your applied stream. Candidates will have to download their Admit Card to join the written examination. CGPSC Sports Officer, Librarian Recruitment Admit Card 2019 will be available on the official website soon. Candidates will be able to download it from there. They need to provide some required information like registration number, application number, and birth date/password. After filling this information, the admit card will be displayed on your computer screen. Candidates can download it here and take printouts for the exam. Librarian- Candidate having Post Graduate in Library Science/ Info. Science/ Documentation Science with 55 % marks from any recognized institute will be eligible for this post. Sports Officer – Candidates having Post Graduation in Physical Education or Sports Science with 55% marks from any recognized institute/ college will be eligible for this recruitment.